How the First Case in Guatemala on the Rights of Persons with Disabilities was Successful | Global Disability RightsNow! Handicapped persons. The State guarantees the protection of handicapped people and those who have physical, psychological and sensory limitations. Their medical and social assistance is declared as an issue of national interest, as well as the promotion of policies and services that allow their rehabilitation and their whole reintegration in society. The law gives regulations for this subject and makes possible the creation of the necessary technical and executive bodies. This law, with more than 20 years of being in force, is currently the only law that refers to (in a backwards way) the rights of persons with disabilities in Guatemala. Although its main purpose is to remove discrimination barriers, it has a medical assistance approach, which is addressed to the care and rehabilitation of people with disabilities, seeing disability as an illness that needs to be treated and healed instead of seeing disability as an inherent condition for people who fight against physical and attitudinal barriers created by society. They are “barriers without which disability would not exist,” in the words of Hugo Castañeda (RIP), one of the architects of the initiative for Law 5125, “Law on Persons with Disabilities,” still pending approval from the National Congress. In 2009, the Republic of Guatemala ratified by decree 59-2008 the UN Convention on the Rights of Persons with Disabilities (CRPD), a compilation of the fundamental rights which in a certain way seems the same for all, including people with disabilities. These basic human rights are limited in their interpretation for persons with disabilities, as I said before, through the physical and attitudinal barriers created by society: a society that sees people with disabilities as persons who need care and attention and not as people who have rights. The ratification of the UN Convention promotes a space for legal battles for equal human rights, and in order to achieve this goal, the Convention establishes the obligation for all States to harmonize their internal legislation with the content of the Convention to make its application viable, through regulations that force people to fulfill them. This legal initiative is an effort proposed in Guatemala but it is still pending approval. 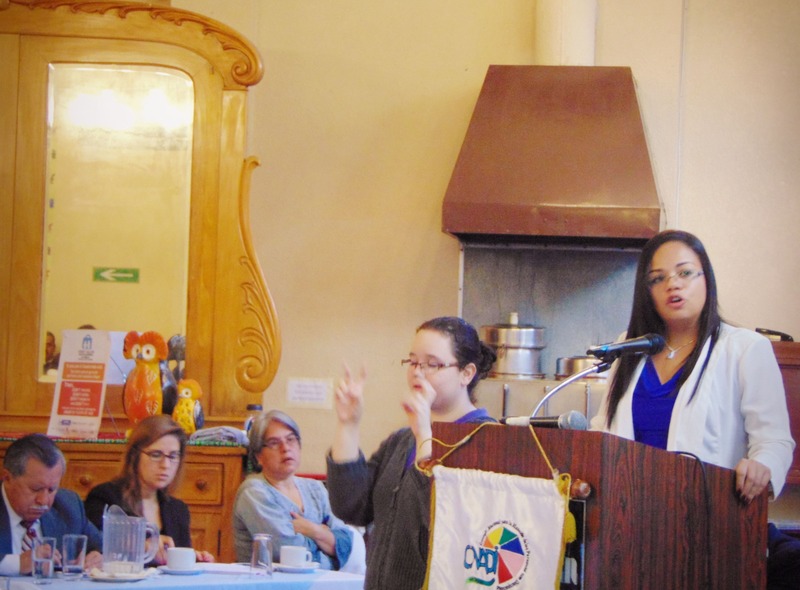 Although there is still not a law framework that effectively develops the rights of people with disabilities, the Convention on the Rights of Persons with Disabilities through its ratification is a valid law in Guatemala and should be enforced. But for it to be applied it requires--in addition to legislative harmonization--a sharing of information among persons with disabilities, who for the most of their lives have had their rights limited and, from not being familiar with having them, assume this situation to be something “normal.” However, there are groups which do know their rights and are willing to use them to give people information and fight for their rights. One strong and courageous leader who has fiercely fought and advocated for his rights and for all rights of people with disabilities is Mr. William Zapeta. He has a visual disability and his tool for being independent is Norm, his guide dog. Mr. Zapeta has been a voice that has already denounced several discrimination cases from being guided by Norm, an animal professionally trained to assist persons with visual disability. One of the cases occurred in a famous fast food restaurant where he was denied access. Today, in addition to the restaurant offering a public apology, it has visibly posted on its entrance doors that it permits access for guide dogs. There was another case however in which the business did not have the same attitude. The case occurred in July of 2015. Mr. Zapeta coordinated an international meeting for people with visual disabilities and requested by phone the lodging services of a hotel in the capital city. The receptionist guaranteed him availability, at which Mr. Zapeta informed him that he uses a guide dog. At this, the receptionist transferred the call to the owner of the hotel, who stated that it would not be possible to host him because the hotel “does not admit pets,” despite Mr. Zapeta’s explanation that Norm is not a pet. Mr. Zapeta filed a complaint with a human rights agency, who received his complaint and subsequently gave me the opportunity to be his Chief Lawyer in the Oral and Public Trial against the hotel owner who refused to personally meet with him. In this case, I had the luck to work together with an attorney who was highly committed to the case and with whom we established strategies for two distinct law suits that complemented each other, in order to give the Judge the sufficient arguments of both law and rights to get the final sentencing according to our goal—about which I should note that my goal and that of Mr. Zapeta was to create a precedent, this being the first case of discrimination on the basis of disability to have reached this step in the process. Discrimination is known as every kind of distinction, exclusion, restriction or preference based on matters of gender, race, ethnic group, language, age, religion, economic situation, illness, disability, marital status, or any other purpose, reason or circumstance which prevent or make difficult someone, a group of people or any association entitling their legally established rights, including common law or traditional rights, according to the republic Political Constitution and the international agreements ratified regarding human rights. State Parties shall take effective measures to ensure personal mobility with the greatest possible independence for persons with disabilities and facilitate their access to assistive devices, assistive technology, and aids for mobility, both human and animal forms of assistance, and capacity related to mobility, and to have them at their disposal at an affordable cost. In addition to referring to the CRPD and its ratification, it was necessary to convince the judge that its implementation is an obligation. For this, I used the arguments established by the Constitutional Court of Guatemala relative to the Constitutional Content, where it is mentioned that in matters of human rights, as stated in the article 44 of the Political Constitution of the republic of Guatemala, all treaties and agreements ratified by Guatemala must be enforced, and as they refer to human rights constitutionally, they have the same hierarchical importance that the Political Constitution does—that is, they are also part of the constitution. We also strengthened the arguments with a base in sentences by the Inter-American Court of Human Rights, which mandates the jurisdiction agencies to make a convention control. This means that the judges must analyze and apply the treaties and conventions ratified by the country in which they administer justice and that their sentences must be given according to them. Having sustained these arguments regarding the treaties enforcement hierarchy and the conventions control, for the first time in Guatemala, in a penal judgement, the Convention on the rights of Persons with Disabilities was enforced. This is a historical sentence in the fight for human rights—a sentence in which the judge valued both the proof and arguments given to confirm the violation of the human rights of Mr. Zapeta by denying him access to a place of public service through reason of his disability. The arguments made by litigating attorneys as a whole—both in facts and in rights—equal Mr. William Zapeta’s courage and initiative who, as a victim, in a personal way has fought for justice, to successfully convince the judge to pass a favorable sentence for the first time in Guatemala on the crime of “Discrimination for disability.” We hope this case is a precedent for all people to demand the respect and fulfillment of the rights of persons with disabilities, and that we will successfully eliminate these attitudinal barriers that impede exercising those rights. Participating in this historic case is, without doubt, a professional experience that fills me with satisfaction and for which I sincerely thank William for the opportunity that he has given me to be his lawyer. But it is also evidence of the long way my country has to go, which goes from empowering people with disabilities in respect to their rights, to informing our society in general (to avoid going to those legal extremes), and also to including professional training programs for lawyers and judges about cross disability rights for people with disabilities. Flor de Maria Salazar is senior attorney at LEGIS, an NGO providing legal and technical legislative assistance, and has been key in drafting the new disability bill and lobbying for the beginning of the legislative procedures in the Guatemalan Congress. She has been working closely with DPOs and other civil society organizations as she spearheaded the national consultation process, working with CONADI, the Congress, and various municipalities. Ms. Salazar is also working on the necessary regulations to ensure compliance with the CRPD and continuing to work with and support the empowerment of civil society leaders, particularly DPO stakeholders.